Ruby Mountain Detour | Meghan Kelly Teles! Juliana and I took a little road trip to Utah to attend Outdoor Retailer thanks to our friends at Flylow and gather some information for our own potential business venture. In addition to attending the show and being visually overwhelmed by the sheer magnitude of outdoor gear, we also did a bit of backcountry skiing in Utah. 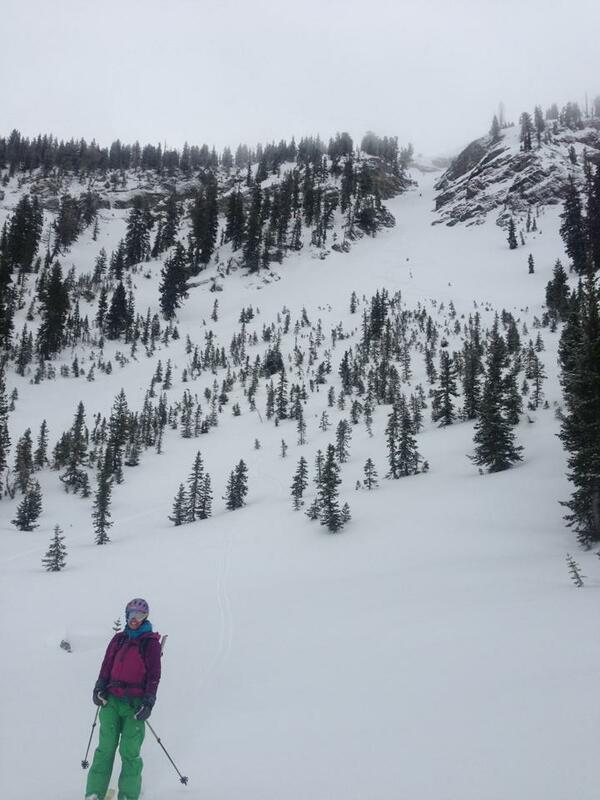 Like Tahoe, Utah hadn’t had considerable snow for at least 10 days, but decent conditions existed in the backcountry. We were grateful for the guidance of our friend Steve who is truly one of the most dedicated backcountry skiers I’ve ever met. Sunday morning we woke up and actually saw the sun for the first time since we’d arrived in Salt Lake on Wednesday evening due to the inversion that had been keeping the city foggy and smoggy. Despite the potential for a snow storm to hit Utah Sunday afternoon, we decided to head back to Tahoe on Sunday after yoga and breakfast in Salt Lake City. The drive in the Salt Flats was harrowing. We saw multiple accidents and were relieved when we reached the Nevada border and the roads seemed dry. We stopped for some tea in Elko at the slowest Starbucks ever and hit the road again only to come to a halt 10 minutes west of our stop on I-80. We were stopped on the highway for 4 hours, unaware of the situation ahead, but aware that multiple ambulances, tow trucks, and police cars were making their way to the scene. It turns out there was a 6 car pile-up in the tunnel between Elko and Carlin and we had missed it by 15 minutes! Thank you slow Starbucks! Making the best of an unfortunate situation, I called my friend Sue who lives at the mouth of Lamoille Canyon to see if we could stay with her for the night. She graciously accepted and provided us with a fabulous breakfast the next morning and her snowmobile to head into the canyon for some skiing. The Ruby Mountains had received 10-16″ of new snow! Avalanche conditions were a bit sketchy, so we decided sticking to low angle slopes would be best. So Juliana and I headed down the canyon via snowmobile right from Sue’s house and had the most fun ever! We skinned and skied two runs once we reached the end of the road and headed back to Sue’s. It was tempting to stay for her trout dinner and hot tub with Ruby Mountain vistas, but it was time to return to Tahoe. Safe to say, we’ll be back! And enjoying the way down!